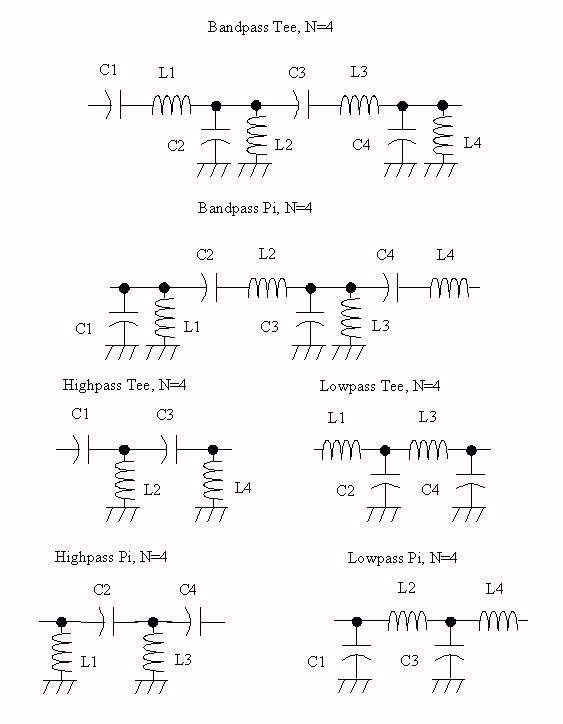 On this page we will discuss the topologies for low-pass, high-pass and band-pass lumped element filters. We will also introduce you to a Microwaves101 download which calculates all of the inductors and capacitors for three-pole, four-pole and five pole Chebyshev lumped-element filters, including low-pass, high-pass and band-pass. This is something that Agilent ADS can't do for you, and Eagleware would charge you big $$$ for! Before we get any further, the analysis below and the free download are all for ideal lumped elements. As you go up in frequency, lumped elements become less and less ideal until you can't make a filter this way at all. If you intend to base a microwave design on lumped elements you will have to re-simulate the filter including all parasitic elements such as parallel resonances of inductors and series resonances of capacitors, and of course all resistive contributions. If you are building an RF filter at 50 MHz you will get good results. 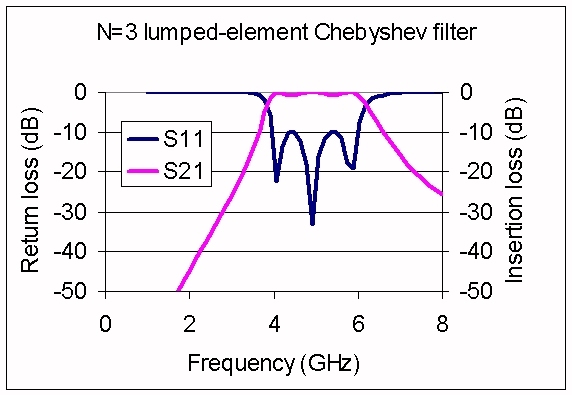 The use of lumped-element surface mount filters above L-band can be tricky. When we are discussing lumped elements, their are two broad categories of inductors and capacitors. The first is surface mount parts, which are suitable for use on a microwave printed circuit board. The second category is thin-film lumped elements, which are used on microwave integrated circuits (MICs) on alumina or other "hard" substrates, as well as in MMIC implementations. Surface mount capacitors can be useful up to Ku-band, while the inductors generally have self-resonances below X-band. Thin-film capacitors are used routinely up to 100 GHz in MMICs. Lumped inductors on thin-films (and MMICs) take the shape of spiral inductors, and are limited to frequencies Ku-band and lower. Inductors are the problem stepchild of lumped element filters and other microwave circuits!! You can obtain 10%, 100% or more bandwidth with lumped element filters. The attraction to lumped element filters is that the filter can often be very compact compared to a filter based on half-wave resonant structures. The terms "tee" and "pi" are used to describe lumped element filters, as well as attenuators and other networks. A tee element starts with a series element, while a pi network starts with a shunt element as shown below. The "tee" resembles a letter T while the "pi" resembles a Greek letter pi. 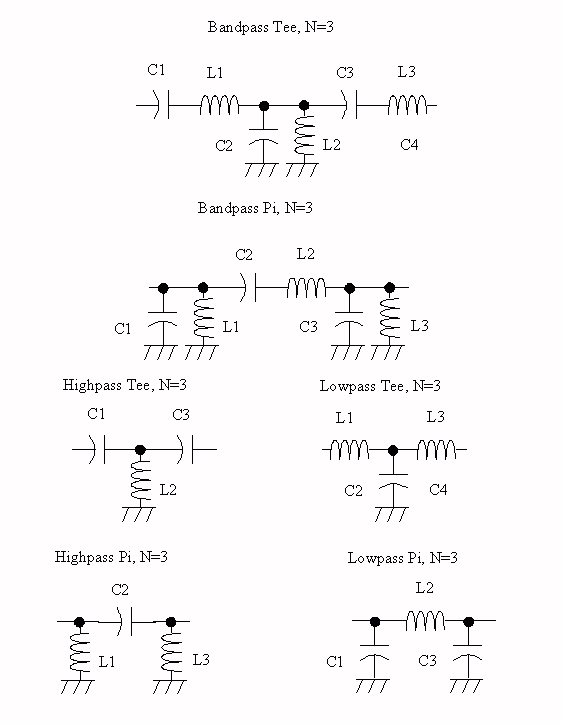 The figures below are for three-pole networks. Odd numbers of poles still resemble the tee and pi letters somewhat, but for even numbers the distinction is nearly lost since a tee network would start with a series element and end with a shunt element. 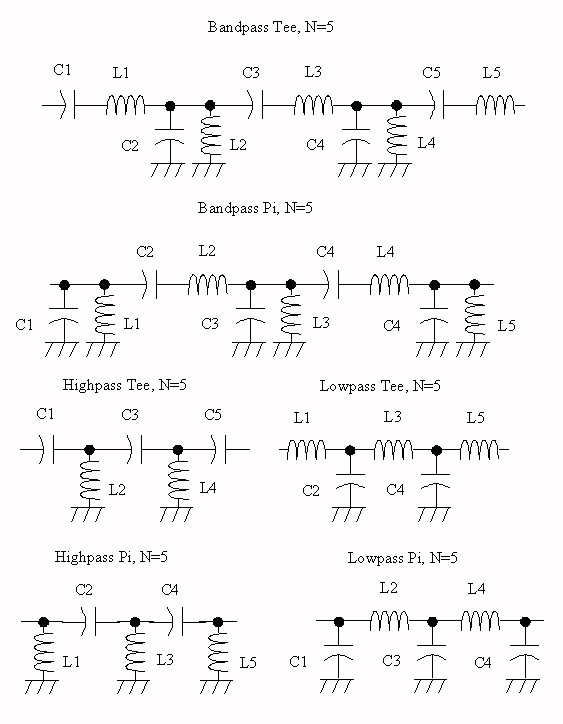 We recommend that you use odd numbers of poles in your lumped element filters because the elements are symmetrical, that is, for a five-pole network, C1=C5, C2=C4, L1=L5 and L2=L4. This will cut down on your bill of materials and there will be fewer possibilities of assembly mistakes. Below are pictures of N=3, N=4 and N=5 filters, pi and tee, BPF, LPF and HPF. Some things to note when selecting pi or tee, which will be apparent when you look over the figures. All HPFs block DC from input to output. In certain cases, filters will present a short circuit to ground on one or both inputs. In other cases the filter will look like an open circuit to DC. For N=even, the two ends of the filter are different. The DC properties of a filter are important to understand. Quite often in microwave design, transmission lines are used to provide DC bias voltages and currents to active devices. The topic of mismatch loss rate its own page, here we will discuss it in the context of filter design. Using ideal, lossless elements, there is a specific relationship between the passband ripple and the return loss of a filter. That is because the passband ripple is 100% due to mismatch loss. The ripple is equal to the worst-case insertion loss, which occurs at the same frequency as the worst case VSWR (the worst case mismatch loss). Note that we have a VSWR calculator that will allow you to convert between VSWR, mismatch loss and return loss! 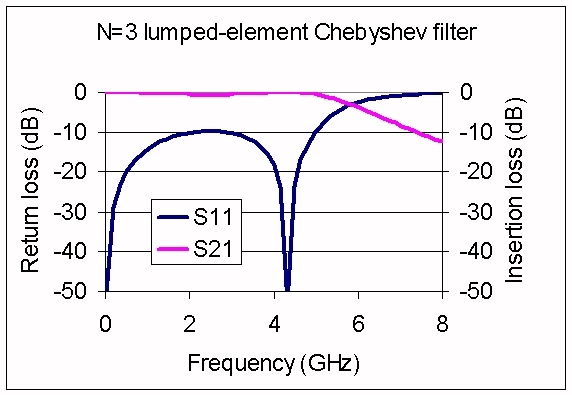 The low-pass filter often is a natural choice for lumped element filters. This is because the parasitics of lumped elements tend to kill the frequency response as you go higher in frequency. For example, you might want to consider adding a lumped-element LPF at the output of your downconvertor design. If you are mixing X-band down to 50 MHz, your output will be clean of RF and LO leakage and you'll be styling! Lumped element low-pass filters are quite often used as "cleanup" stages for planar-resonator filters, to defeat reentrant modes. In the figure below we compare low-=pass designs for 0.5 dB ripple, cutoff frequency 5 GHz. Note that the return loss is directly related to the insertion loss S21. For 0.5 dB ripple, you get about 10 dB return loss. The other thing to note is that the skirt on the N=5 filter falls off far faster than for N=3. 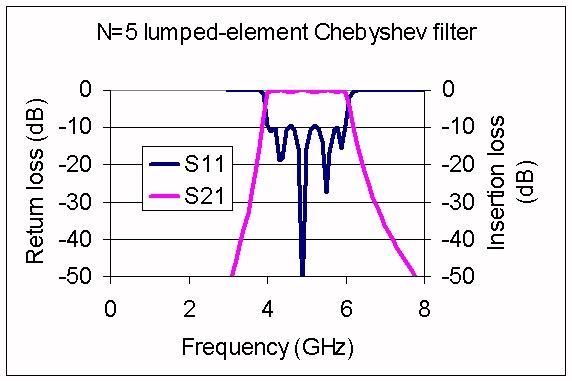 In this example, if 8 GHz was a critical frequency you need to block, you might not get enough rejection with N=3 (about 12 dB), but with N=5 you might satisfy your requirement because you would have 30 dB rejection. High-pass filters are tricky. Because of parasitics your high-pass filter will actually end up more like a band-pass filter, its frequency response will eventually die out. But you can certainly design a filter that will reject low frequencies using lumped elements. A DC block is a simple example. We'll add some examples, check back later! Used in bandpass filters, lumped elements can really help your designs. Not only are the resulting filters compact, but they have no "natural" reentrant modes that you will encounter with other filter technologies such as planar resonator structures. In each resonator of a lumped-element bandpass filter you will find both an inductor and a capacitor. The series elements, the L-C is combined in series. In the shunt elements, the LC is combined in parallel. Screw this up and you will create a band-stop filter instead of a bandpass filter! Just refer to our figures above and you can't go wrong. 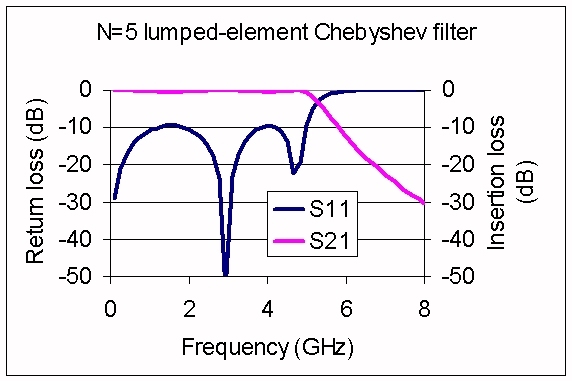 Below we compare lumped-element Chebyshev bandpass filters with passband 4 to 6 GHz, and 0.5 dB ripple. The first plot is for N=3, the second plot is for N=5. Note that the skirts are much steeper for the higher-order filter. Again, the return loss of 10 dB is a function of the specified ripple of 0.5 dB. Which filter you would pick must be determined by how much rejection you need at specific frequencies. One other "curiosity" about lumped element Chebyshev bandpass filters is that the lower skirt is steeper than the upper skirt. What gives here? The explanation is that the skirts would look equal, if you plotted the frequency on a logarithmic scale.